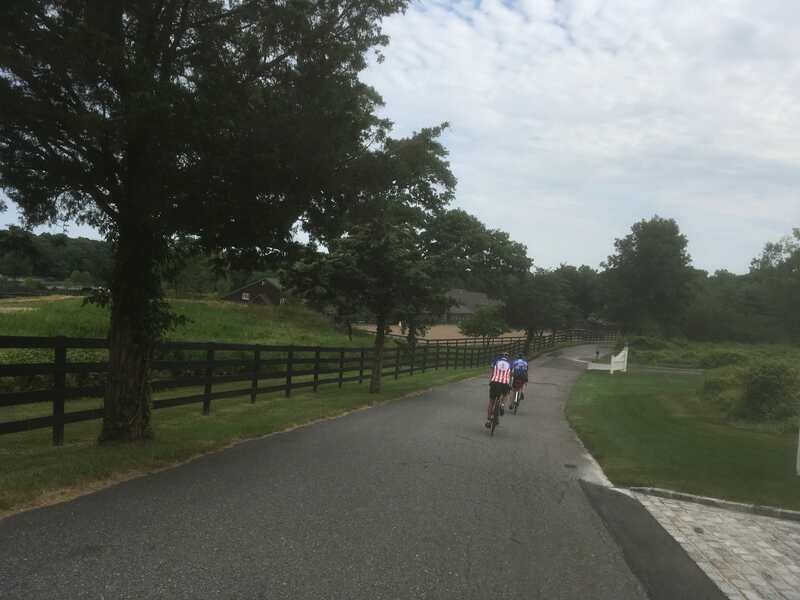 At 6:00 AM Saturday I started the Long Island Randonneurs’ Bethpage 300k–my first 300k, and my longest-ever ride. I managed to finish a bit after midnight. I did not do a great job of preparing for this ride. I hadn’t ridden much since the 200k in June: one 87-mile ride and a lot of puttering around the city. I tried to ensure that I’d sleep well in the week before the ride, avoiding alcohol completely and turning in early, but I slept fitfully all week anyway–perhaps it was this awful, muggy heatwave we are enduring in NYC right now, or maybe I was just nervous. The night before the ride was no more auspicious. Due to the early start, I stayed at a nearby hotel with M–. But I procrastinated on packing the bike and had to rush to catch the train at the last minute, missing dinner (and losing my sunscreen en route). We then had difficulty finding food near the hotel and ended up eating passable Indian delivery at 11:30–hours after I’d hoped to be sound asleep. I rode most of the way with Stuart, a randonneur I’d met earlier in the season on the Jones Beach Populaire. For a while we rode with Dan, a two-time ancien, and were regaled with stories of Paris-Brest-Paris and London-Edinburgh-London. But after the first manned control we went on by ourselves. The weather was hot and humid, and it was a struggle to stay hydrated. Given my poor preparation, and the fact that I’d never done this distance before, I approached this ride very differently than the 200k. For that ride I’d known I could handle the distance and wanted to keep my time down by minimizing time spent at controls. For this one, I wasn’t sure I could even finish, so to avoid “the man with the hammer” I tried to err on the side of eating and resting too much rather than too little. (At Stuart’s inspired suggestion, we did make an unscheduled stop for crepes–having a little hot food was well worth the time spent.) And this route had quite a few controls–eight not including the start or finish–so the end result was that we spent quite a bit of time stopped. (RideWithGPS says over two and a half hours, and I managed to inadvertently stop recording with 30 miles left in the ride, so that’s probably too low). Despite this we were never in too much danger of missing a cutoff, and we finished in 18:25. We were not quite the lanternes rouge–two other riders remained on the course; one abandoned shortly after our finish, while the other planned to complete it. The route starts and ends near the Bethpage station of the Long Island Rail Road. But the LIRR had decided to close that section of the line this weekend, so to get home I’d need to ride to the adjacent Hicksville station, four-and-change miles away. As I set off following the directions on my phone, a downpour began. As my phone led me onto stranger and stranger back streets, I began to worry, and when I stopped to check, I saw that somehow–perhaps the water soaking my jersey or my gloves had triggered something on the touchscreen–it had begun routing me to someplace called “K Uniforms,” a twenty-mile ride. I tried to re-enter my true destination, but my hands and phone were so wet the touchscreen had become unusable. I stopped at a nearby all-night pharmacy and dried my hands and the phone off with a coupon circular, and was glad to realize that I’d at least been going in the right direction; it was only another mile to the train. Back into the downpour I went, and a few minutes later I was on the train back to Queens.